The 1800’s were a time characterized by rapid industrialization and growth started by the Industrial Revolution. The social changes during this time were various and widespread, influencing aspects of life including art, religion and politics. The changes were not always positive, as society passed through sophomoric phases while dealing with new concepts and situations. This period saw several prominent shifts; one being the move of individuals from artisan to worker. Whereas an artisan was seen as a skilled craftsman, the worker was considered a part of larger system or machine designed to manufacture products. Secondly, there was a shift to urbanization as workers moved in from rural farming societies. These large changes influenced secondary changes. The increase in consumable goods and disposable income encouraged materialism. Urbanization, along with an overall increase in free time, allowed for the communication and sharing of ideas, including the spreading of philosophical and political ideals. One such idea taking shape at the time was that of eugenics; the idea that human genetics could be improved by the selection of contributors to the gene pool. Although the qualities which were perceived as improvements may be contested, race and hereditary conditions were often considered. These factors combined to create a complicated environment for individuals with physical or mental challenges. Though socialism was on the rise, the disabilities of those with challenges were more prominently considered than their abilities. As society became more of a machine, the potential for an individual to take part in the machine determined their value and role in that society. It was in this environment that Braille was introduced as a method of reading and writing for blind persons. Braille is named after its creator, Louis Braille, who was blinded in a workshop accident at the age of three. 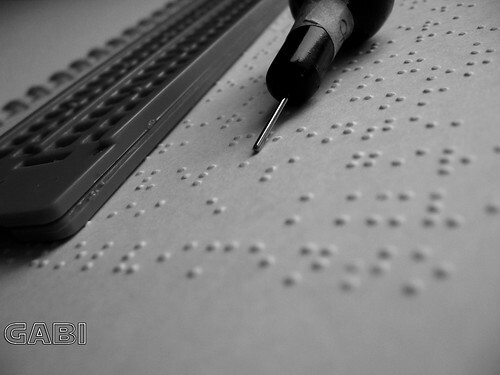 Prior to the creation of Braille, blind persons communicated predominantly through speech. Some attempts had been made to use large embossed or raised type for written pieces, but these proved to be too slow or inaccurate for practical use. Aside from this, blind persons would be required to rely on sighted individuals for assistance. Braille was built upon an existing concept called “night writing” which was developed in order for French soldiers to be able to communicate at night without light. Braille condensed the unsuccessful night writing system to be legible with one finger, overcoming one of its primary hurdles. The system is made up of a series of raised dots in six possible positions to correlate with a letter of the alphabet, blends, numbers, punctuation symbols, contractions or abbreviations. Differing Grade levels exist within Braille, as well as differences which exist between languages. To add to the complexity created under the umbrella of Braille, there were additional systems being developed as improvements such as New York Point and Boston Line Type. This inconsistency in approaches led to a slow adoption of Braille as it lacked the universal acceptance required to create necessary resources. An additional complication existed in that educators of blind persons were often not blind themselves. From their perspective, Braille presented new methods which strayed from the mainstream without adding any value which sighted individuals could easily perceive. It was not until 1932, over 100 years after the creation of Braille, that a uniform Braille code was adopted by English speaking countries. This slow adoption muddies the attribution of Braille’s effects on the blind population. Comparative statistics on jumps in employability or independent living from the 1800’s fail to exist. However, Braille offers apparent benefits to the blind population. First and foremost it affords a method of attaining literacy designed to address the needs of the specific audience. The benefits of literacy can then be generalized to this situation. In the time before conveniently recorded sound, this literacy allowed for communication across time and space, and between individuals who never had to meet. In comparison to other printed alternatives available to blind persons at the time, Braille allowed for a degree of fluency which was not possible otherwise. Reading was impeded by the speed at which embossed letters could be distinguished, while writing would require the use of movable print. Unprinted alternatives would require assistance from others and would only require oral participation from the blind person. Technological alternatives to Braille are often credited with some of the decline in Braille literacy from 50% in the 1960’s to 10% today. (Pagan, 2010) However, technological alternatives are often audio based, such as audio-books or text-to-speech software. In comparison to these, Braille offers the convenience of the codex system, allowing for quick referencing of information. In addition, it continues to make the characteristics of a written culture available, rather than being restricted to an oral culture. The key benefit of Braille literacy is independence. Whereas people with disabilities during the Industrial Revolution were often devalued for their inability to take an active role in the production machine, Braille allowed blind persons one step of independence closer to full participation. Today, it removes literacy barriers from the blind, enabling them to independently read and write, and gather and disseminate information. Without Braille, the blind community would become predominantly an oral culture, taking on the characteristics of such. With the current abundance of information, and the need for abstract concepts and intellectual experimentation, providing the possibility of a literate culture provides the necessary tools for the blind community to participate in modern society self sufficiently. Ryles, R. R. (1996). The Impact of Braille Reading Skills on Employment, Income, Education, and Reading Habits. Journal Of Visual Impairment & Blindness, 90(3), 219-26. Spungin, S. J. (1996). Braille and Beyond: Braille Literacy in a Larger Context. Journal Of Visual Impairment & Blindness, 90(3), 271-74. This entry was posted in Research Paper and tagged braille. Bookmark the permalink. The connection between ones worth and an ability to contribute to the ‘machine’ is still alive and well I would think. I’d also note that tech assistance also involves magnification, but there are also modern refreshable Braille ‘printers’ and ‘keyboards’ that connect Braille to the modern computer experience. It’s also an interesting footnote that more than a few of the early ‘hackers’ were blind.